It was a good night for Mr Romney. The string of character witnesses early in the evening were affecting and powerfully humanising. The continuing pitch to Hispanic voters, from Craig Romney's brief speech in Spanish to Marco Rubio's star-making turn, promises to bear fruit for the Republicans. Mr Romney's acceptance speech didn't rock the rafters, but that's not his style. What he did manage to do was, for once, make himself feel emotionally present, and not so canned. He told Americans they deserve better than Obama, and he made the case that he'll do better as clearly and forcefully as he ever has. I don't think he has it in him to do much better. It may be good enough. [O]n balance, I thought it was fairly weak as a speech. He’s the underdog and he’s the guy who needs to have a galvanizing introduction to the general public. In those terms, it was a missed opportunity. A pretty big one. I am not sure the speech was “a game-changer.” I am not sure it “moved the needle.” I’m not sure it will be remembered beyond tomorrow, or that it was watched by sufficient numbers of people tonight to make a difference. But it did lay down a subtle challenge for the President: Explain why your contract should be extended. Explain it in a way we can understand. And it laid down a stylistic challenge as well: in these difficult times, is it really necessary for you to accept your nomination in a football field in front of 74,000 people (as Obama will next week)? Do we really need those bread and circuses? 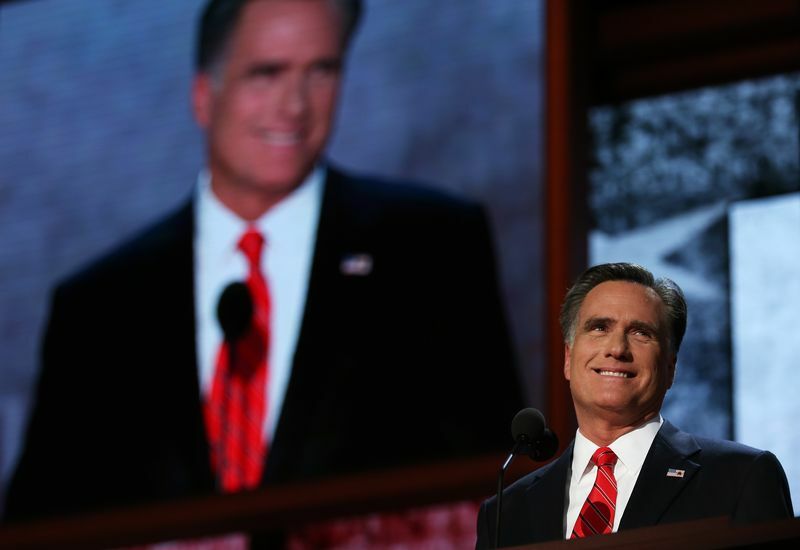 Romney managed to say even less about what he would do as president than he usually does. Despite Republican Vice Presidential nominee Paul Ryan's promise earlier today that Romney would discuss his plans for the country in "granular" detail, Romney offered almost nothing in the way of a governing vision, much less specific legislative goals. Instead, he criticized Obama for running up too much debt, and, in practically the same breath, for cutting spending on Medicare and the defense budget. Vote Republican! Romney is shallow and incoherent on policy for strategic reasons. He attacks from whichever direction is likely to be effective — even if that means getting to the president’s left, as on Medicare — and keeps the focus on Obama’s failures. Getting too specific might lead people to focus on Romney instead. That strategy might be enough to win the election. But it does not help the public figure out how Romney would run the country. [T]he same exact playbook is there in 2006, as it was in 2004 and 2008, and as it is 2012. Domestic oil production, school choice, trade agreements, cut spending and reduce taxes and regulations – it's been the conservative answer to times of deep economic stress, times of economic recovery, times of economic worries and times of economic panic. Which is another way of saying that the Republicans have no plan forhow to actually deal with this specific crisis we face. Under the circumstances it was probably the best speech he could have given. And that's the problem. He's still Mitt Romney. He's solid and business-like; deliberate and plodding. He's standing as a CEO and he talks like a CEO. He's more comfortable in front of a PowerPoint than a crowd. There's no crime in that. But when the balloons have been released and the confetti scattered there is not a lot of political mileage in it either. The audience came to its feet out of duty not spontaneity. They would love him to win but they don't love him. They never have. A generic speech and a generic convention for a generic Republican candidate.